One of the midweek meals I rely on often is Baked Chicken Parmesan. It’s fast, delicious and goes well with so many different sides. I usually serve it atop Fettuccine Alfredo, a green salad and garlic bread. It’s so versatile and extremely easy to make. I won’t name names, but I have a few picky eaters in my family. This is one chicken dish that they all agree on so its frequently my go-to meal when I’m short on time. As a matter of fact, I made Baked Chicken Parmesan for dinner a couple of nights ago and my family went on and on about how good it was. It’s tender, juicy and crunchy. My son said, “The seasoning on this chicken is perfect.” Well, thank you very much. If you have company drop by unexpectedly, this is the perfect meal. It doesn’t get any easier, yet it looks and tastes like you’ve been in the kitchen all day. The chicken needs to be thin to cook evenly and quickly, so I always pound it with the flat side of a meat mallet. Place two pieces of chicken in a large freezer bag. Make sure the chicken is flat and not rolled up. Pound with a meat mallet until thin. Repeat with the remaining chicken. You can also use a rolling pin if you don’t have a meat mallet on hand. Melt butter and mix with sour cream. Dip chicken in the butter/sour cream mixture, then in parmesan cheese. Place on a baking pan that’s been lightly sprayed with cooking spray. Melt butter and cool slightly. 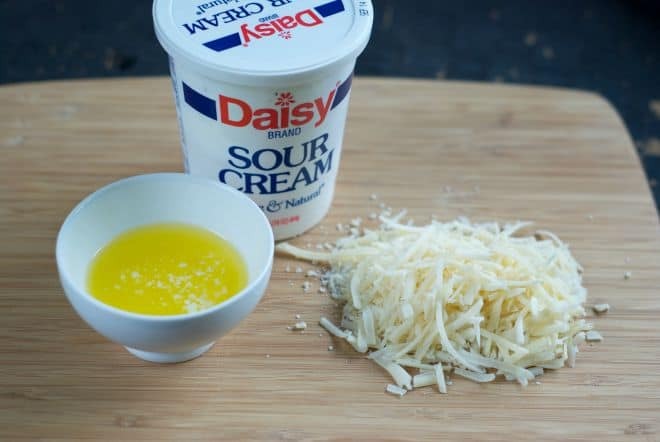 Mix with sour cream. Coat each breast generously with sour cream mixture. Roll in parmesan cheese mixture. Place chicken on a baking sheet sprayed lightly with cooking spray. Bake uncovered in 375º oven for 25-30 minutes. When I serve baked chicken parmesan for Sunday lunch, I do everything ahead of time except the baking part. I store the chicken in the fridge. When I get home from church, I remove the chicken from the fridge and then preheat the oven. I’ve also used boneless, skinless chicken tenders for this recipe. They take about 20 minutes to cook. Plus, they aren’t as thick as regular chicken breasts, so it doesn’t take long to pound them. When the entire family comes over, I make a large batch of chicken. I just double the melted butter, sour cream, and parmesan cheese. In a medium saucepan add butter and heavy whipping cream. Simmer over low heat, stirring occasionally for two minutes. Whisk in the seasonings and simmer for one minute. Add the parmesan cheese and whisk until completely melted. Serve immediately. What’s your favorite go-to meal when you’re in a hurry? I don’t think we’ve ever tried this in baked form. I should! It looks like something we’d love for dinner. I’m a huge fan of chicken parm. This is one of my favorite meals. Some people think it is difficult and time consuming to make. You have proven them wrong. this is always a big staple in our house esp when the colder months come! YUM! so excited to try this! I love the idea that I can do this and less than 30 minutes. It makes dinner so much easier to figure out when I know I don’t have to take forever to cook. I will have to try this for sure! This recipe is AMAZING! I love the seasonings and that it turned out juicy and delicious. I can’t wait to make this! This looks absolutely amazing! What a delicious looking idea for a dinner, I have to admit anything made with parmesan is a win for me. I love baked chicken parmesan! Your recipe looks so savory and delicious! I want a big forkful of that yummy pasta right now! That looks delicious! I’ll have to make this soon. I thought it would take a lot longer to prepare. I love chicken parm but it takes so long to prepare. This is definitely a recipe timesaver that I can’t wait to try. I love that this is baked. Makes it much lower in calories!! I have to try your recipe for this dish! This recipe looks so yummy. I haven’t made chicken parm for my family in so long. Looking forward to giving this a try. This looks super delicious. I would have that with steamed broccoli and felt like I had been treated to a special dinner. I always forget to put Baked Chicken Parmesan on our family’s menu – well not anymore! I’m going to pin your recipe because this one’s definitely a keeper! My husband love chicken parm but I prepare it in a different way. I would love to give your recipe a try, it looks delicious. We actually had Baked Chicken Parmesan last week, but the recipe I followed didn’t have sour cream in it. Next time, I’ll follow your recipe instead. Yum! Ahh, this looks so good! I’d love to add this to are meal plan. I love that it’s so easy to make! Just from the look of this baked chicken parmesan recipe, I would think it would be difficult to make. Looks so good and yummy!